After finishing a book about WWII, my initial reaction is "NO. NEVER AGAIN. THAT WAS TOO SAD AND I DON'T WANT TO SOB UNCONTROLLABLY WHILE READING. I HAVE TOO MANY FEELINGS" (or something like that). But seriously, WWII books are real downers, for obvious reasons, and I tend to avoid them. So why on earth did I pick up Sarah's Key? Obviously I like torturing myself. We get a split universe of sorts in Sarah's Key. 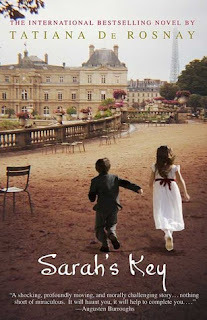 One world is that of Sarah, and young girl in 1940s Paris. When police officers come to round up her and her Jewish family, she locks her little brother in a cupboard for safe keeping until they return. Her last words to him are a promise that she'll come back for them. Unfortunately, to her unknowing, she and her parents are to be taken to a concentration camp. We follow her amazing and heartbreaking story through the concentration camp as her only wish is to get back to her brother. On the other hand, we also meet Julia, a journalist in modern day Paris. She does some research on Paris' involvement in WWII and digs up information on Sarah's story and family. Feeling deeply connected to her, Julia tries to track down Sarah's fate and see if she's still alive. Normally I don't like when there are two characters with completely different storylines in a book; usually it seems that one doesn't belong. However, I really enjoyed Julia's story and her own family problems. It's a book I would've read on its own. I really can't stop raving about Sarah's Key. I've recommended it to everyone I know, even those who aren't readers. It's an amazing story that may not always have happy endings and will leave you feeling sick to your stomach at times, but will still inspire you the same. 5+ stars! Has anybody seen the movie? I've heard it's a good adaptation, but always feel wary about these situations. great review. for some reason when I read it.. I was not that moved, which is odd for me with WWII books. I think Julia's story makes Sarah's story bearable. Without those breaks I don't think I could bear it. Great book. One to definitely recommend. I loved this book so much! It's one of my top favorites, and I recommend it to everyone, too! I haven't seen the movie yet, although the trailer looked promising, but I'm a little nervous too...you never know how the movie will stand up to the book. I read this one a couple years ago for my book club. I didn't like it, but I was certainly in the minority. Glad it worked for you! I LOVED Sarah's Key! I picked it up a while ago and always recommend it to people who want a good read! I tend to avoid WWII books as well, but I've heard so many people rave about it that I just HAVE TO read it as well! It's good to hear that even though you avoid WWII books, it was still amazing! The movie was fairly good. I didn't love this book as much as you...I think it was more the writing than anything in the idea. I've read mixed reviews for this book, but I really want to read it. It's been on my TBR list for way too long and I'm such a sucker for historical fiction. This was such a good book! I read it for my bookclub and accidentally started reading it out of schedule and got completely absorbed in it! I loved Sarah's story! I had gotten the movie out from the library, but it wouldn't work in my player. :( Glad you liked it! Man, I couldn't even finish "Sarah's Key!" I loved Sarah's story, but Julia's (the modern one) just felt like a preachy pile of cliches. Her French husband is a cad! Nazis were mean! Sigh. I skimmed those parts just to get back to Sarah's story, which was absolutely heart-wrenching. I wished the whole book had been just Sarah, even if it would have been emotionally harder to read. I've seen the film trailer and the movie looks good but I haven't seen it. Of course I want to read the book first so if you're raving over it then I'm more inclined to pick it up now and try it for myself. I loved this book too. I agree with Annette - Julia's sections made Sarah's bearable by giving you a bit of an emotional break. I liked both stories and wasn't annoyed by Julia's storyline. I also liked the movie, although like usual it's not nearly as good as the book. I saw it about a year after I read the book though, which I think is better than watching the movie right away. I loved Sarah's Key too! The movie was also amazing in my opinion. From the acting to the filming it was a really good adaptation. You should definitely check it out. I refuse to see the movie because the book was spectacular! I recommend it to everyone as one of my top reads of all time! I especially loved how it was a Holocaust book that took place in France, which isn't a place where you would think of first, second, or even 5th for having to do with the Holocaust.